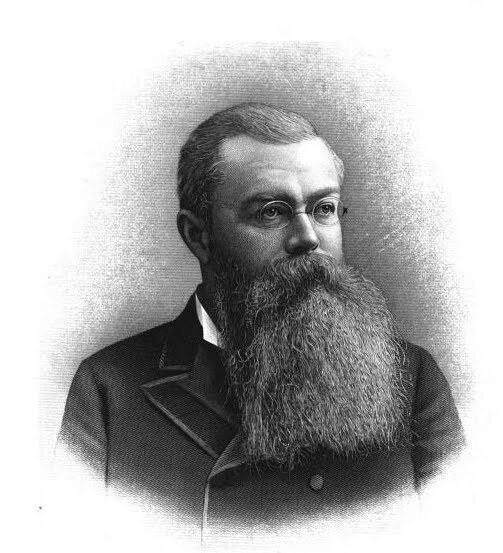 Only son of financier Alexander Mitchell and father of aviator William “Billy” Mitchell, John Lendrum Mitchell (1842-1904) was a prominent banker, Civil War veteran, philanthropist, and legislator. A self-described farmer, Mitchell’s interests included scientific agriculture, horse breeding, social reform, literature, and art, all of which he pursued at his Milwaukee-area estate Meadowmere. Mitchell was a staunch advocate of education; he served as president of the Milwaukee school board and helped found the University of Wisconsin’s Agricultural College. He served in House of Representatives (1891-1893) before being elected to the U.S. Senate for a single term where he became noted for his anti-imperialist stance on American involvement in Cuba and Hawaii. ^ Isaac Don Levine, Mitchell: Pioneer of Air Power (New York, NY: Duell, Sloan and Pearce, 1943, 1958), 11-13; Frederick I. Olson, “City Expansion and Suburban Spread: Settlements and Governments in Milwaukee County” in Ralph M. Aderman, ed. Trading Post to Metropolis: Milwaukee County’s First 150 Years (Milwaukee: Milwaukee County Historical Society, 1987), 27. ^ Ruth Mitchell, My Brother Bill: The Life of General “Billy” Mitchell with an Introduction by Gerald W. Johnson (New York, NY: Harcourt, Brace, and Company, 1953), 29; Levine, Mitchell, 14-15, 4, 28-29. Levine, Isaac Don. Mitchell: Pioneer of Air Power. New York, NY: Duell, Sloan and Pearce, 1943, 1958. Mitchell, Ruth. My Brother Bill: The Life of General “Billy” Mitchell with an Introduction by Gerald W. Johnson. New York, NY: Harcourt, Brace and Company, 1953.